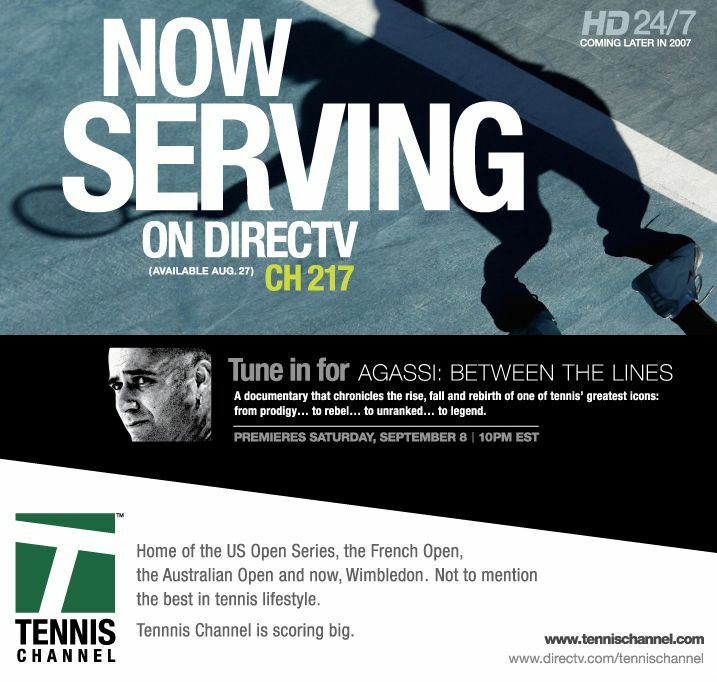 Channel 217 will be Tennis Channel's new home when the sports and lifestyle network launches on DIRECTV Monday, Aug. 27. The channel’s position centers it perfectly for its audience, next to ESPN’s pod of channels (ESPN, ESPN2, ESPN News, ESPN Classic) and NFL Network immediately before, balanced by lifestyle categories such as Reelz, Food Network, E! and Style right after. The nation’s largest satellite provider will carry Tennis Channel on its broadly distributed Choice Xtra programming package, which currently reaches more than nine million customers. Additionally, both DIRECTV and Tennis Channel have plans to offer the network in high-definition near the end of 2007. This will mark the first time fans anywhere will be able to watch Tennis Channel in HD. In May, DIRECTV offered a free “Sneak Peek” during Tennis Channel’s comprehensive coverage of the French Open, another of tennis’ four Grand Slam competitions. A special Mix Channel allowed viewers to watch six matches simultaneously or select any one at full-screen size, providing access to up to 300 hours and more than 100 additional matches. In addition to the expanded coverage, DIRECTV customers had access to results from current and previous-day play, along with real-time updates of live matches. Another interactive feature provided detailed information about upcoming matches on each of the Court Channels. Tennis Channel is the most concentrated single-sport network in television, with more than 60 tournaments throughout the year, including three of the four Grand Slams. The network’s catalog of original series and specials includes player interviews, tournament behind-the-scenes, superstar “days in the life,” real-life tennis friendships, tennis vacations and hundreds of hours of exclusive documentary programming.